Words can be uplifting and degrading. They can be inspiring and painful. Words can cause a smile and tears. Words are like toothpaste because once they are out there, you can’t take them back. These verses only scratch the surface of all The Bible says about the tongue. It’s no wonder so many of my clients need to work on communication issues! Words can have extremely positive impacts and a severely negative ripple effects. It can be difficult to control your words, but the key skill to work on is S-L-O-W-I-N-G D-O-W-N. Reactivity is often one of those moments when we realize how much words are like toothpaste. We blurt something out in the moment, but don’t have control and end up steering the ship the wrong direction or starting a forest fire. Next time you catch your words getting ready to burst out in a destructive way, think through these questions before you do. 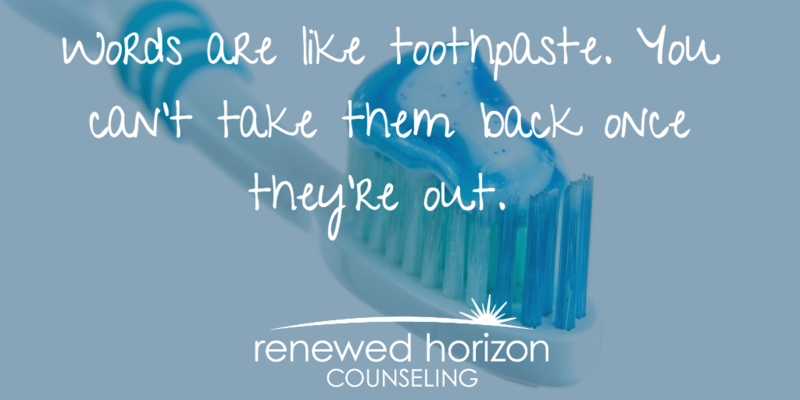 It just may prevent you from having to buy new toothpaste and cleaning up a big mess in your relationship! Are there any other questions you’ve asked to be intentional with your words?